Do you ever get twitchy fingers when you're not checking your phone like every 5 minutes? It's a bad habit I must admit. I'm guilty of doing this when going out with friends, family or the Mr, but I want to make more of a conscious effort of really switching off. 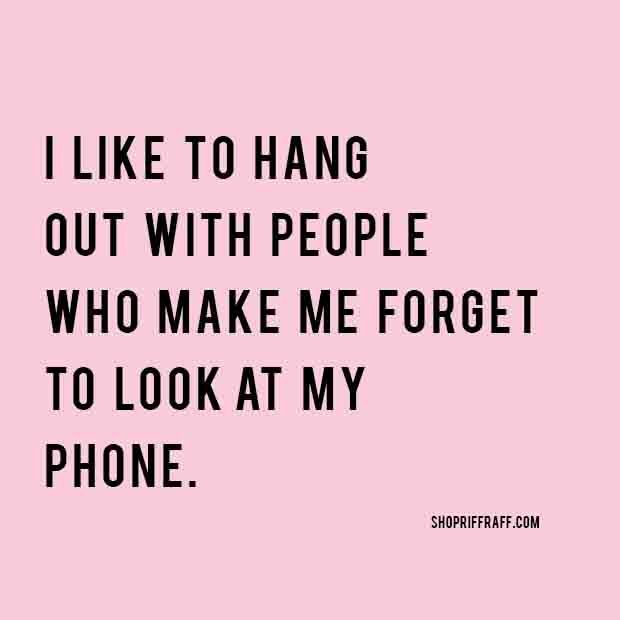 I want to socialise with people without being glued to my phone! OK so that means no phones face up on restaurant tables, no 'got to just send a quick text' or 'I'm just waiting for an email from my mum'. Here's how to really switch off from your phone *deep breath* we can do it guys. We all want to take a snap of what we're eating, drinking etc but we don't need to spend ages editing and choosing filters right there and then. I like to take a quick snap and edit them when I get home. No one likes sitting across from someone when they're face down in Instagram and snapping everything from the bread basket to the wine cooler! By no means a popular suggestion but actually saying 'no phones at the table' or 'whoever uses their phone has to pay the bill' might actually work! It's a bit cheeky but the fact that you brought it up makes people think twice about whipping out their phones. Tough love works. Leave your phone on silent or turn off notifications all together. If you don't hear your phone beeping or vibrating every few minutes, you won't feel agitated and desperate to check your phone. I have a flashing light on my Samsung phone for notifications, so I leave my phone in my bag so I don't see the light going off and having a disco on the table. Does it bother you when people are on their phones? Worth a read: Maintaining a good work life balance. Totally agree with these. We try and have a no phones at the table rule but I always break it first for an Instagram snap!! I also don't have notifications on at all, so much more relaxing. I'm usually quite good at switching off, but if I get a text I feel I have to answer there and then! So I think I'll try your ideas and put it in my bag - or put it on airplane mode! Haha I know it's hard to resist a sneak Instagram snap! im pretty good! Although too good that I can not look at my phone during my work hours 9.30 - 5.30...by the time i pack up to leave for home, my battery is dead from all notifications and messages. So i don't engage until it's dark at night! I think it's annoying with friends/other people, but for some reason I'm not bothered if it's just me and Jon. Usually we are very courteous about it -- i.e., "I'm sorry, I have to respond to this work email." and then it is put away for the rest of the meal. Maybe with my friends I'm annoyed because I don't see them as often? I have notifications turned off unless connected to wifi. So I'll only get them at home. I do the same thing with photo's & post them later as well. Except now when I get home my phone goes nuts with all the beeping all at the once! lol. Great tips! I have to admit that i sometimes unconsciously check out my phone every single second when I'm with company, but I do always eventually try to stop it. We do really need to enjoy who we are with. Wow that is a long time to really switch off from your phone! I agree with the friends/partner thing, it's when you don't see certain people for a while and then they're always on their phone can be a bit annoying! I know when you don't check your phone for ages, all the notifcations goes off all at once!